“It’s always a challenge playing East,” said junior Evie Coleman. “I wasn’t here freshman year, but that was the year we beat them to get to state, so there is a lot of tension with that. And then they were ranked higher than us last year. Coleman provided a spark off the bench and tied for the team lead in scoring with junior Karina Bursac at 11 points. Coleman drilled two three-pointers and had eight first half points as Middleton jumped to a 26-10 lead at the break. Coleman finished the game 4-of-8 shooting and made 3-of-6 three-pointers. Kind was satisfied with the production from Coleman. East had 31 turnovers of its own and made only 3-of-12 free throws. The teams shot a combined 10-of-31 from the line and had a combined 61 turnovers. Middleton scored first and never trailed. The Cardinals got their first bucket of the season off the tip-off from senior Hannah Flottmeyer just six seconds into the game. Middleton ended the first half on an 8-0 run and led, 26-10, at the break. East scored the first four points of the second half to cut the deficit to 26-14, but Middleton responded with another 8-0 run to extend its lead to 34-14. The Cardinals’ largest lead came with just under nine minutes to go in the game when they held a 43-17 advantage. East ended the game on a 19-4 run to make it 47-36. Purgolders senior Ashala Moseberry. Moseberry had 13 points over the final seven minutes on 5-of-6 shooting, including three three-pointers. Moseberry finished with a game-high 15 points — all in the second half — after missing her first five shots in the first half. Middleton shot 17-of-51 (33.3%) from the field and 6-of-19 (31.6%) from three-point land. East finished 15-of-53 (28.3%) on field goals, going 3-of-24 (12.5%) from three. With just two seniors nine juniors and a sophomore on the roster, Middleton is hoping to build off of its 15-8 record from last year. 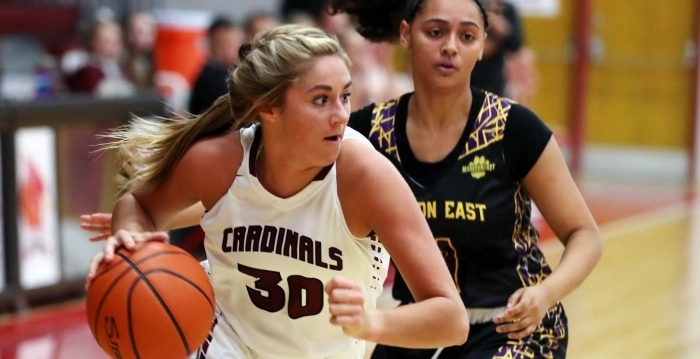 Beating Big Eight rival Madison East is a good way to start, as the Cardinals play their next three games on the road. “We hustled out there and we did a pretty good job rebounding,” Kind said. “We can be better at rebounding, because a lot of the rebounds we got we brought the ball down and they got a jump ball on us. With our size, we have to be able to control the boards. Controlling it will be something to work on. On deck: Middleton was at Verona Tuesday, then travels to Monroe Nov. 27 at 7:15 PM. MIDDLETON — Schwartz 0 1-2 1, Lemirande 1 3-4 6, Hodson 0 0-0 0, Tanin 3 0-4 6, Roquet 0 0-0 0, Coleman 4 0-0 11, Bursac 4 2-4 11, Dunn 2 1-3 6, Flottmeyer 3 0-2 6. Totals: 17 7-19 47. EAST— Meyer 0 0-0 0, Bentley 3 0-0 6, Hilliard 0 2-2 2, Alston 0 0-0 0, Gottschalk 2 0-2 4, Smith 0 0-3 0, Moseberry 6 0-1 15, Boston 3 0-0 6, Fadele 0 0-0 0, Harvey-Williams 1 1-4 3. Totals: 15 3-12 36. Three-point goals: M- 6 (Coleman 3, Lemirande, Dunn, Bursac 1). E- 3 (Moseberry 3). Total fouls- M- 17 E- 19 Technical fouls: East (Hilliard).